Spring Break this week of April 14 - No Classes April 15-20th. before tHE RYC at BFC on Saturday the 20th. We provide all equipment for beginner classes. Our next session will start the week of March 3rd. Kids classes are Tuesdays or Thursdays 4-5pm, or Saturdays at 10am. Teen/Adult classes are Tuesdays or Thursdays 7-8pm. It's $175 for 7 weeks plus $10 US Fencing Assoc. membership, Please fill in our interest form. We do not hold regular classes during the summer – but will offer summer camps. Vivo Club Owner, Coach and World Champion Arpad Horvath began fencing in Budapest, Hungary in 1989 and was a Hungarian National Team member for six years in a row. Arpad won the Under-17 World Championship as well as the Under-20 European Championship and received a full scholarship from St. John’s University in New York. There, he went on to become a two-time individual NCAA men’s epee champion. Arpad has been coaching for 12 years and has been in coaching in Massachusetts since 2010. He founded Vivo Fencing Club in 2012. Molly Sullivan Sliney was a member of the 1988 and 1992 United States Olympic fencing teams. She also won two gold medals in the 1987 and 1991 Pan American Games. While fencing for the University of Notre Dame, she was the NCAA Women's Foil Individual Champion in 1986 and 1988. Molly also was U.S. National Champion in 1985. In 1987, she led the Notre Dame Women's Foil Team to an NCAA championship by posting a 10-0 record in the tournament. This was the first time the Fighting Irish had ever won an NCAA Women's title in any sport. She graduated with a 160-14 record, and Notre Dame named her 1980s Female Athlete of the Decade. Molly has been an active public speaker and fencing instructor in the greater Boston area since 1992. FEATURING - FENCING + FUN SLEEP AWAY AT CAMP SKYLEMAR! $1250 Early Bird - Pay $500 Deposit by April 15 and balance by June 22. Regular register $1350 - pay $500 deposit at registration by May 15 and balance by June 22.. After that as space allows. - please email ann@vivofencingclub.com CLICK HERE FOR REGISTRATION. APPLICATION FORMS CAN BE DOWNLOADED BELOW. Pre SN Camp: Intensive Training with the best! Intensive Training pre-Summer Nationals for kids going or not. Great experience! 10am – 2:30pm each day. Fencers bring their lunch, please. All Vivo Fencers eligible for this 7-week course. . Class from 6-7pm, then 7-8pm Open Fencing and Optional Private Lessons. For our once-a-week youth fencers PLUS kids new to fencing. Monday Aug 5 – Friday Aug 9 in our air conditioned fencing club! 10am – 2:30pm each day. Fencers bring their lunch, please. We provide all equipment and do the rest. What a great to spend a week of fencing PLUS fun. Camp Skylemar is a wonderful place to go for a custom Vivo-designed camp. This is a great fencing camp PLUS you won’t have to give up the best of a summer camp. Ages 10+ can apply. World Champion Arpad Horvath and two-time Olympian Molly Sullivan Sliney will head up the staff. Counselors will supervise the girls and boys’ cabins and other activities. We will have an accredited waterfront director on staff to oversee water sports. Program starts with lunch on Sunday August 11 and runs through mid-morning on Sunday August 18th. FENCING SET UP will be IN THE CAMP GYM. We will set up the fencing strips in the Camp Gym for one good training period per day. The rest of the day will be spent at the water front (with an accredited waterfront director) or playing tennis, soccer, b-ball, 5-hole golf and mini-golf too, hiking, or even rainy day activities. At night - movies, skits perhaps, and of course, campfires! AND THEN…there are all the other sports and camp activities to enjoy! Basketball. Tennis. Soccer. Archery. Hiking. 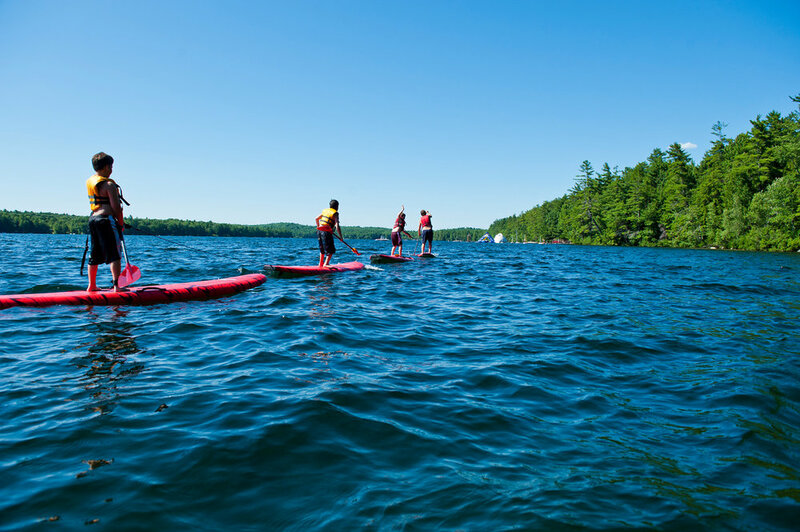 Swimming, inflatable slides, kayaking, paddle boarding. Golf. Mini Golf, and more. See photos below. Cabin Living. Family style meals with great choices. Always salad and pasta bar. Yummy homemade desserts. Cookouts, camp fires, evening activities in the lodge. FLy Over: link to a 6-minute fly over video of the camp! Favorite lunches include chicken tenders, tacos, burgers and grilled cheese. Dinner is always special, with fresh baked rolls and the salad bar. If you don’t care for what’s served, there’s always pasta and other options. There are cookout nights too, Desserts are homemade, and fruit is always available. If there are certain things you can’t have or need to have, the chef will take care of you! Living in a Skylemar cabin is like a sleepover party. Not only are your friends in the room, but your counselors are there too. You’ll never feel alone at Skylemar. Each cabin has 5-8 campers and a counselor. We will need you to please download and fill out these forms: We are setting these up now. Health Form - requiring doctors signature and vaccination history. 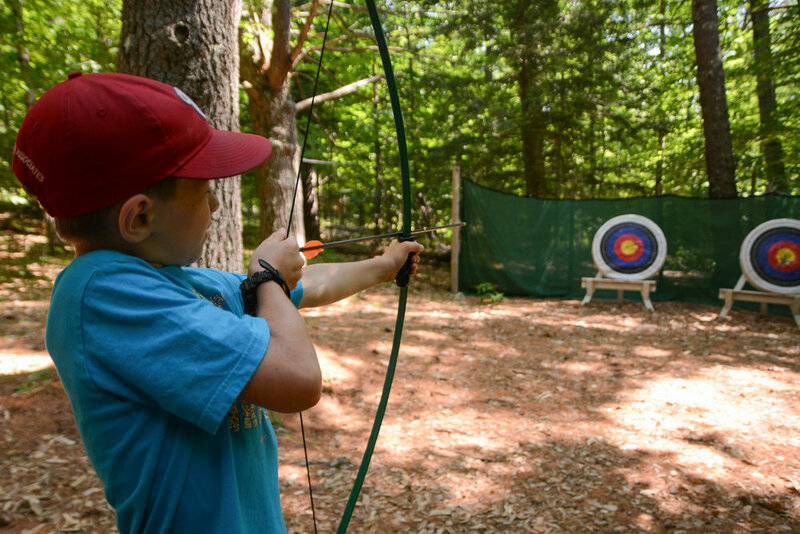 Camp Skylemar is located 2 hours north of Vivo and 55 minutes from Portland ME. It is run as a summer boys camp from July to early August. We will be using their facilities after their camp is complete. Established 65+ years ago, it is kept totally up to date and is now run by Arleen Shepherd, the daughter of the founder, along with her husband Shep Shepherd. See below for our class descriptions and registration links. $10 non-competitive US Fencing Association Membership is required and we include it with your class package. Refund policy for Beginner Classes: a full refund will be issued if notification is given prior to the second class. Monthly cost/class is $175. Recurring credit card payment is requested. $10 non-competitive US Fencing Association Annual Membership is required. Renew directly online at www.usfencing.org Upgrade to competitive membership when you start to compete! Monthly cost/class is $100. Recurring credit card payment is requested. For the intermediate who wants to fence twice a week! $175 Limited Vivo Annual Club Membership is required. This is a 10-month September-June program. Recurring credit card payments are requested. $340/month class fee – includes 1 private lesson/week. $460/month class fee – includes 2 private lessons/week. US Fencing Association Membership: All fencers at Vivo are required to be a member of the U.S. Fencing Association. There are non-competitive and competitive memberships. Competitive fencers are expected to renew online directly with USFA. What is the beginner class refund policy? For Beginner Classes only, a full refund will be issued if notification that you would not like to continue is provided prior to the second class. If you are just starting, sign up for our of out 7-week Beginner terms. If you have fenced before, one of the Vivo coaches will let you know which class is right for you. 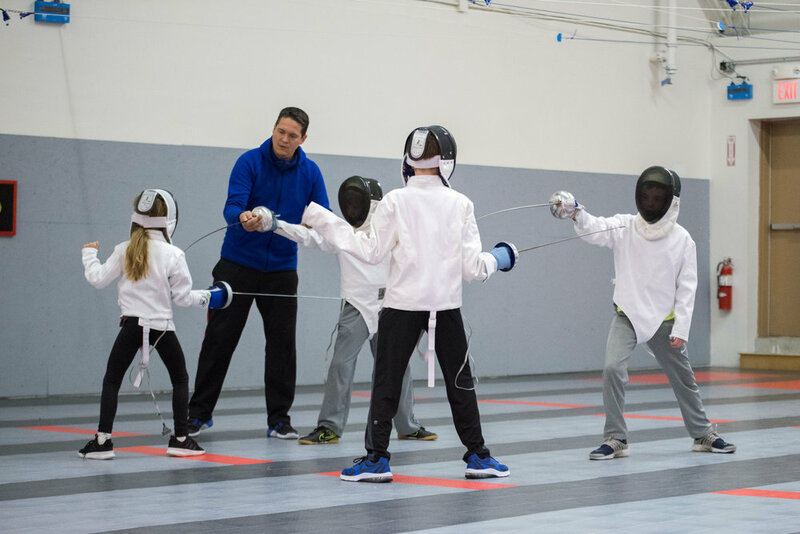 If your child has had fencing classes through a rec program or other club, we’ll evaluate your child and then place him or her accordingly. What age do kids have to be to start fencing classes at Vivo? We prefer to have kids be 7 years old before they start classes with us. That way, it’s easier for them to follow the class directions and be an important part of the class group. Class members should bring athletic shoes, preferably court shoes, to wear on the strip. No open toed shoes are allowed. Please don’t wear your fencing shoes outside as we aim to keep the strips clean. You should wear warm-up pants and a tee shirt. We do NOT allow shorts. What about the fencing equipment? Vivo provides all the equipment necessary for once-a-week classes. Fencers in the Intermediate and Competitive classes provide their own uniforms and equipment. When should I get to Vivo? Plan to arrive 10-15 minutes before the class start time so that you can sign in, get your shoes on and be ready to start on time. Plenty of parking is available outside of the building. Are you hard to find? What if I want to buy my own equipment? Talk to us and we will make recommendations to you. We will order the equipment for you to ensure the correct fit and to save on your shipping costs. Do I have to be a member of Vivo to take classes? Participants in the once-a-week classes do not have to be club members. All fencers in Intermediate and above must become members of the club. We have two levels of membership. $175 for the LIMITED Vivo Annual membership that covers twice-a-week fencers, and $300 FULL Vivo Annual membership for the competitive classes. This allows the fencers to take private lessons and covers coaching at local area competitions. Do I have to join the US Fencing Association? Non-competitive beginner fencers and Intermediates must join the USFA at the $10 non-competitive rate. Competitive class fencers must have a competitive membership — the fee is $75 per year. As a USFA competitive member you are eligible to compete in USFA-sanctioned competitions. Private lessons are included as part of the monthly package fee for competitive fencers. Intermediate fencers can sign up for optional lessons at $35/20 minutes. You can use our online private lesson scheduler to sign up.